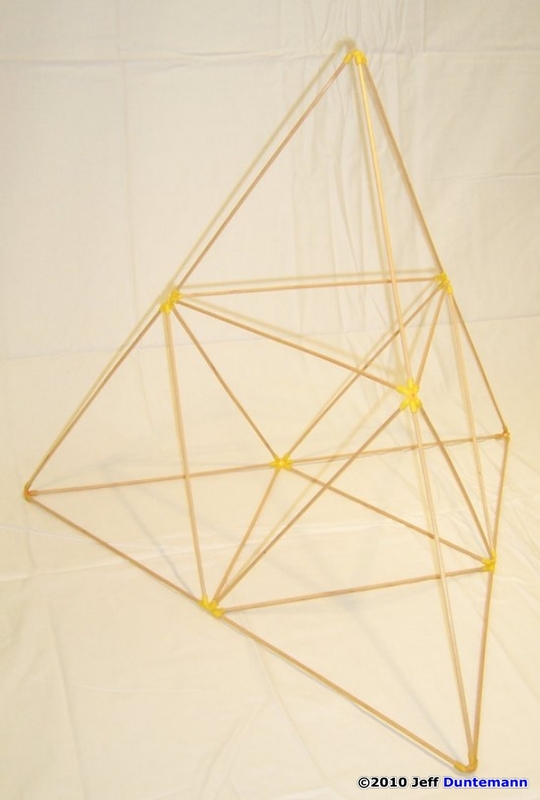 You can make tetrahedral kites with more than 4 cells, and I have made the next “bigger” size, which is ten cells. 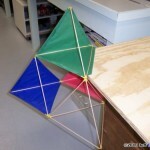 It seems to me that the more cells the kite has, the better it will fly, assuming it isn’t too heavy. 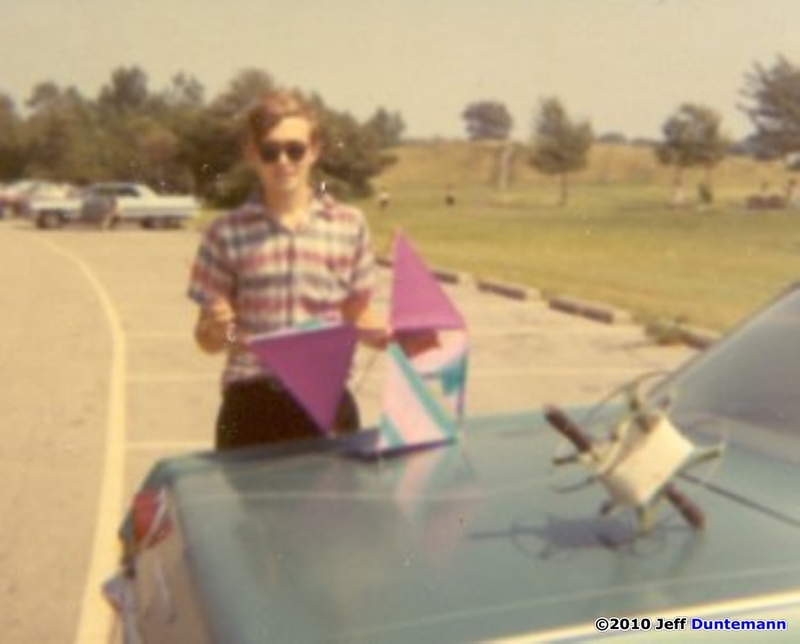 D-Stix are not suitable for making larger kites than the one I’m presenting here. The connectors are too heavy, and the 1/8″ dowels are not stiff enough. 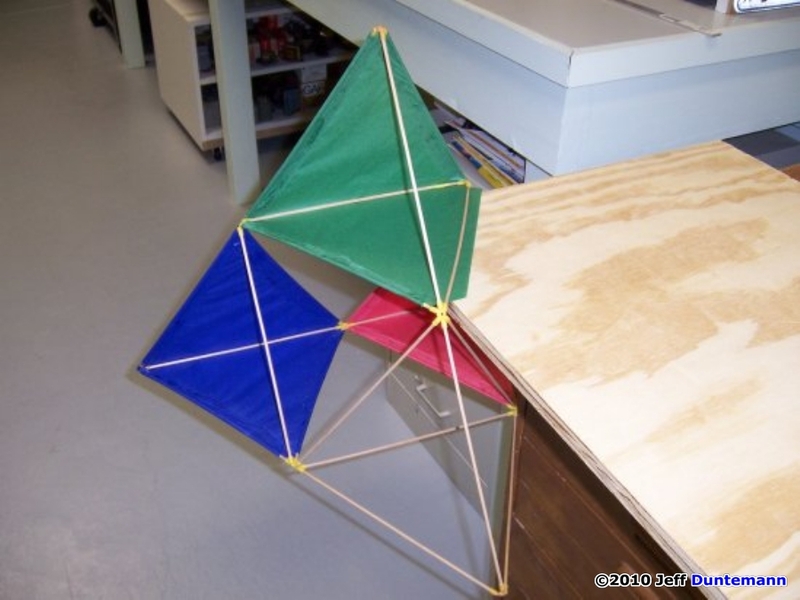 The kite shown above was made with 36″ hardwood dowels. The dowels forming the 4 outer edges were 1/4″ in diameter. The other dowels were 1/8″. The kite was a little heavy, but it flew well with a tail. (The photo shows it lying on the grass upside-down.) 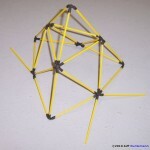 Without the convenience of D-Stix connectors, tying and gluing all the sticks together was a huge amount of work! 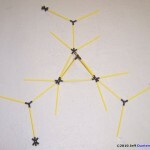 After years of looking, I’ve begun to see new-build D-Stix sets available online, mostly from teacher supply stores. 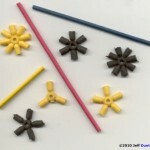 Google around for “D-Stix set”; many places sell them. I have not bought one of these and I’m not sure how good the connectors are. They aren’t the awful black rubber that was being sold in the 1970s. The sticks look like plastic, and I still recommend that you use unfinished wooden dowels. One thing you won’t get with the new D-Stix sets is the paper template for the cells’ sails. I had it easy: All I had to do was trace the outline onto sheets of colored tissue paper and cut them out. You’re going to have to do a little drafting, as I’ll explain shortly. Take a look at the model shown above. 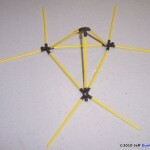 This is a small version of the kite skeleton, using 4″ sticks. 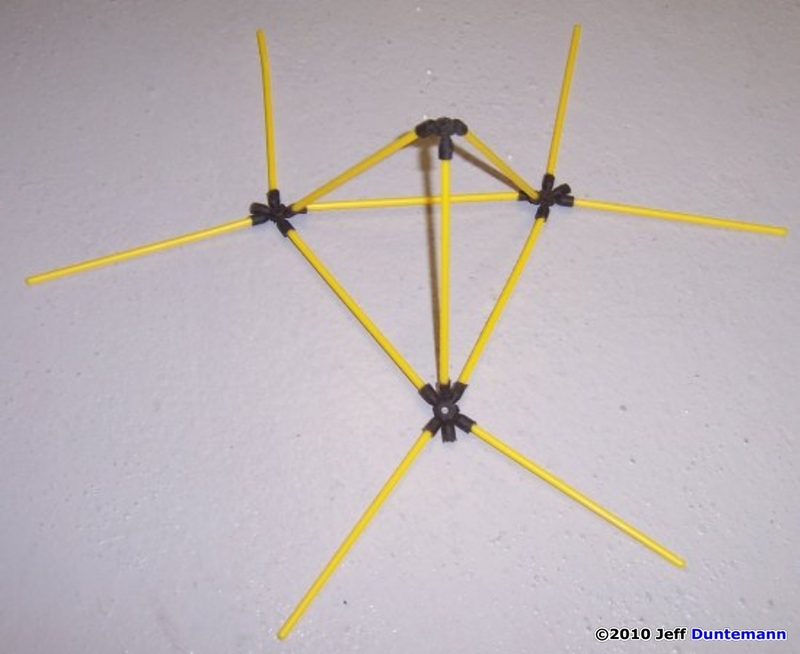 It’s far too small to be a kite, obviously, but it will show you the general way that the D-Stix connectors and sticks go together. For the real skeleton you will need 24 identical 10″ sticks. The sticks should ideally be unpainted wooden dowels 1/8” in diameter. I no longer have the sticks from my original D-Stix kit, but found unpainted 1/8” dowels in 36” lengths at Home Depot. I have also seen them at craft stores like Hobby Lobby and Michael’s. In my kite I made the sticks 10” long. Why 10”? 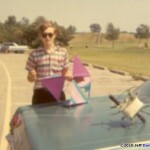 From the few fuzzy photos I have of my original 1969 kite, that seems to be the length I used. A 1970s vintage D-Stix kit I bought also has 12” sticks, but after some experiments I found that at 12”, the kite is a little too flexible. Smaller than 10” makes the kite too heavy for the sail area it would have. 10″ is about right. 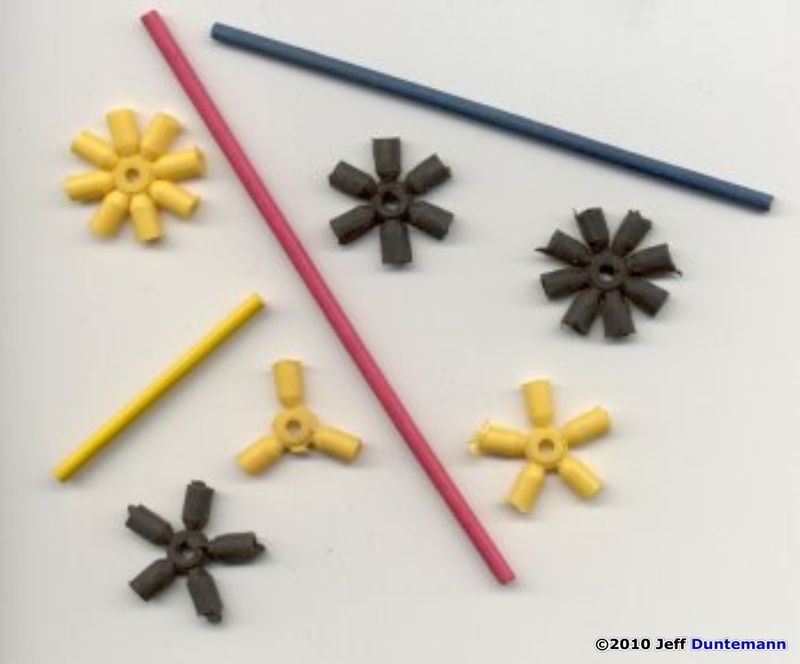 You will need ten D-Stix connectors for the kite: four connectors with three sockets, and six connectors with six sockets. The D-Stix kit does not include a three-socket connector, but you can easy snip three ears from a six-socket connector using diagonal pliers. You can use the 6-socket D-Stix connectors for the six-stick joints, but I found that modifying an 8-socket connector by snipping off two sockets with a wire cutter works better. (Below.) The angles are a little more natural for the connector, and there’s less stress tending to pull the sticks out of their sockets. The way the skeleton goes together is much easier to show you in photos than to explain here in the text. 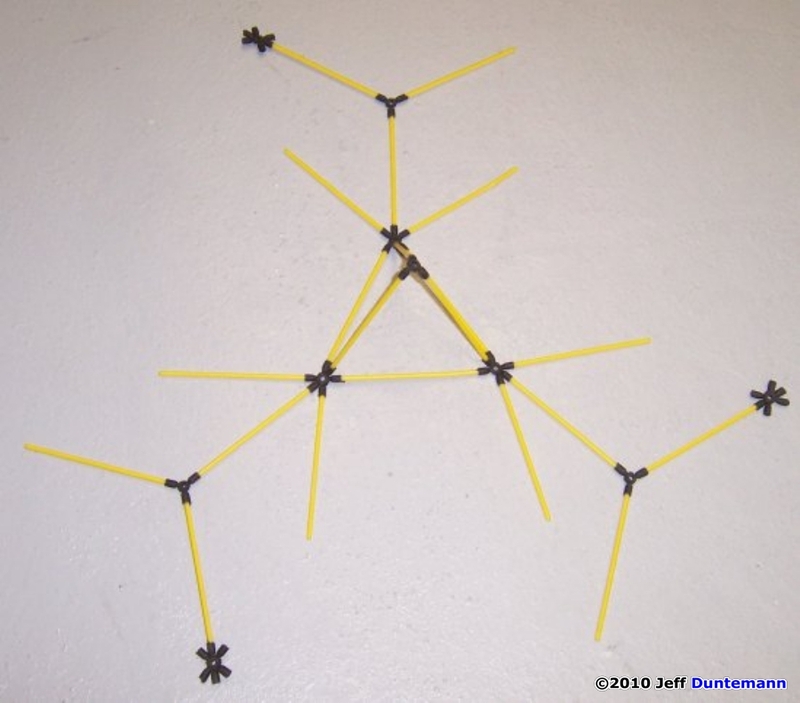 I’ll be using the yellow model rather than the actual skeleton, but the arrangement of the sticks and the connectors is precisely the same. The next step is a little more complicated. Look carefully at the photo. We’re adding the rest of the connectors to the lower vertices, plus all but three of the remaining sticks. 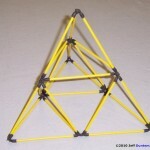 Build this step flat on the table or floor, as shown here. 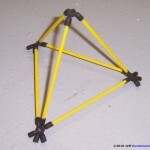 The next step is to “fold up” the sticks and connectors now lying flat on the table to form the lower three tetrahedrons. Three sticks will still be missing; these are the sticks that lie on the bottom of the kite. Short of taking a movie, there’s no easy way to explain this. 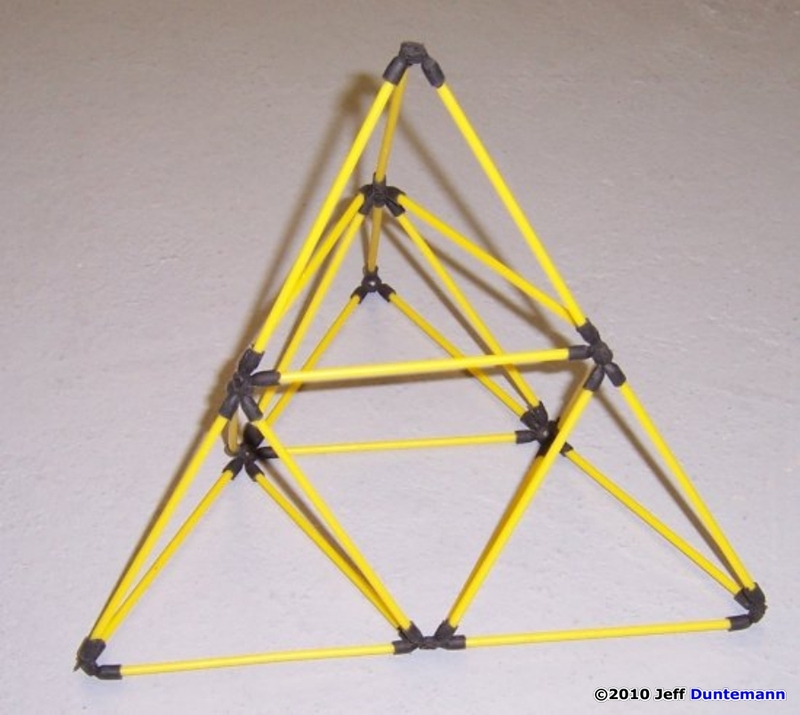 I suggest taking one of the three “dangling” 6-socket connectors and working counterclockwise, plugging in the loose ends of the sticks to form the lower tier of three tetrahedrons. (Look ahead to the next photo.) 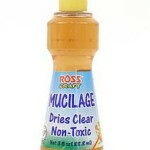 You may make a couple of mistakes, but they will very quickly be seen as mistakes, and the nice part about D-Stix is that you can yank them out again without damage to the parts. I drew the template on a sheet of thin Hobby Lobby posterboard with a felt marker, a steel rule, and a quaint piece of ancient technology known as a “drafting triangle.” Although I’m an old guy and that’s how I learned to draw in the 1960s, I would have drawn the template in a drawing program like Visio if I had a printer that would print something that large. I don’t, and you probably don’t either. If you do, it might save you some time. 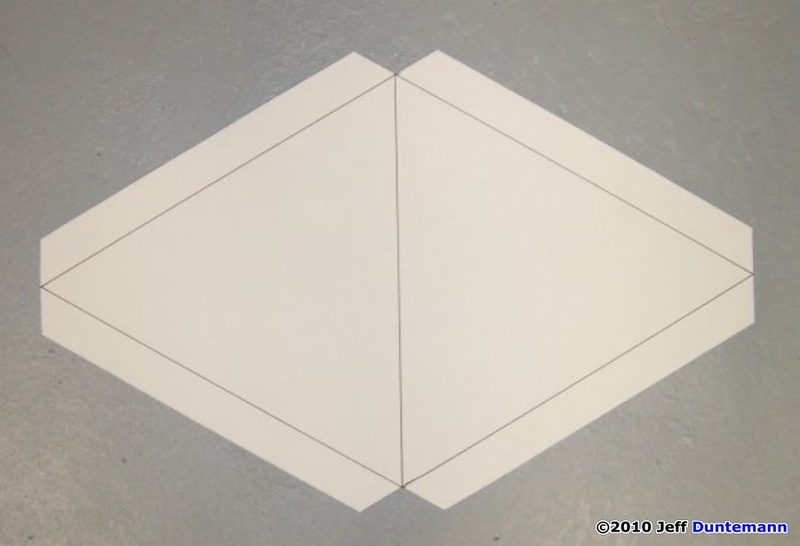 Art stores and craft stores (like Hobby Lobby) still carry drafting triangles, and you want one with a 60° angle. (The other common type has two 45° angles and a 90° angle, and that will not help you here, though it’s a good thing to have in your kitemaking kit.) 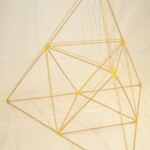 The two faces of each cell in the kite are equilateral triangles, and all the angles in an equilateral triangle are 60°. Draw the joined equilateral triangles first. Then extend the edges as shown to form the flaps. The flaps are 1″ wide, and are cut such that when you fold them over for gluing, they will not overlap. After you’ve drawn all the lines, cut the template out of the posterboard so that it looks like the one in the photo. Use a paper cutter to cut the long edges if you can. 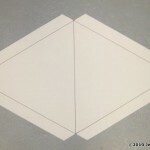 You want the edges to be straight and smooth so you can trace the sail shapes onto the paper you use to build your kite. The notches you can cut with a craft knife. Choosing a paper for any kite is tricky. Tissue wrapping paper usually comes in some very nice colors and patterns, but it’s a little thin to use single-ply. Christmas wrap is often very fragile (it’s for ripping, after all!) and kraft paper is a little too heavy for a kite that has a lot of sticks, as all tetras do. What I did now (and did in 1969 as well) is to use a double thickness of tissue wrapping paper that I bought in a package of several colors at Hobby Lobby. Although I’ve never tried it (I like paper for kites!) it’s certainly possible to use the template to cut out sails from plastic trash bags or Hobby Lobby mylar wrapping sheets. Mylar is a good kite material and I’ve used it in other designs, but it doesn’t glue easily, and when using Mylar you should use plastic tape to fasten the flaps. It’s easiest to glue the flaps when the cell face you’re working on is lying flat. 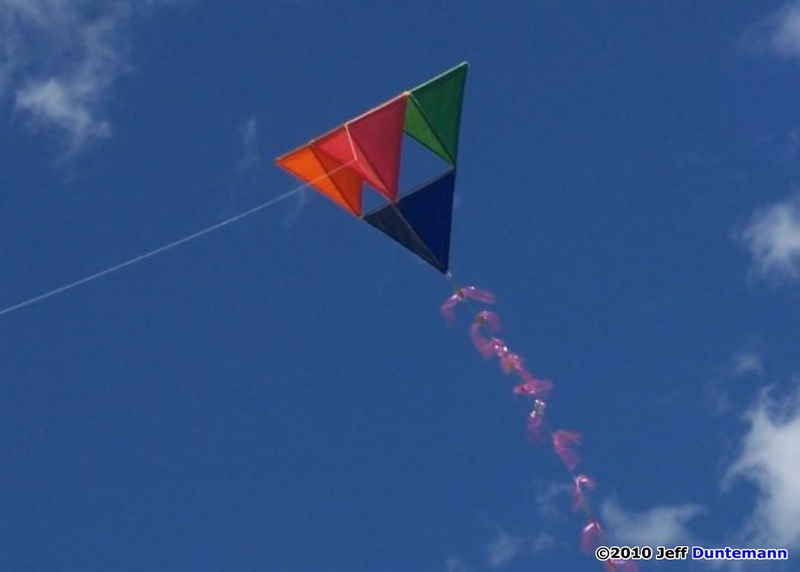 Place the kite on a table or on the floor with the working face down, spread glue on each flap in turn, and fold it over, smoothing with your fingers. 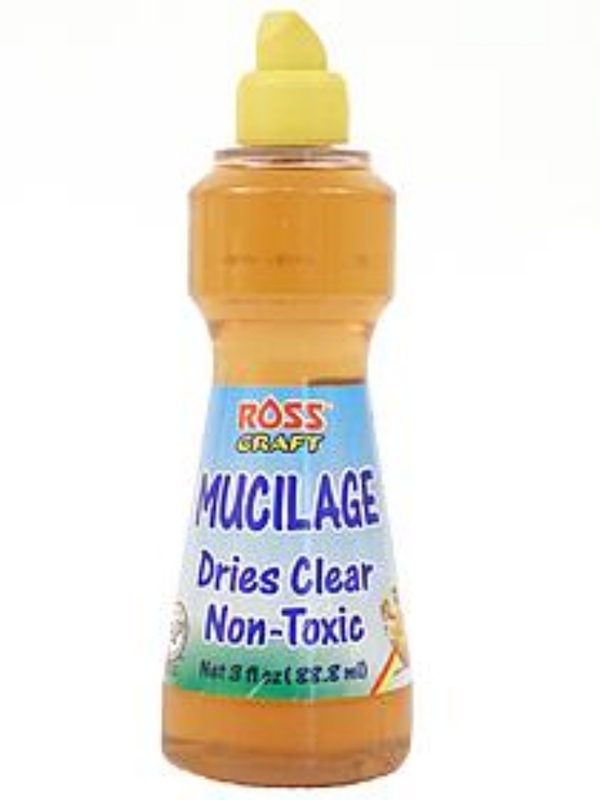 Remember that you’re dealing with two layers of tissue, and make sure there’s enough Elmer’s glue or mucilage to soak through the tissue. 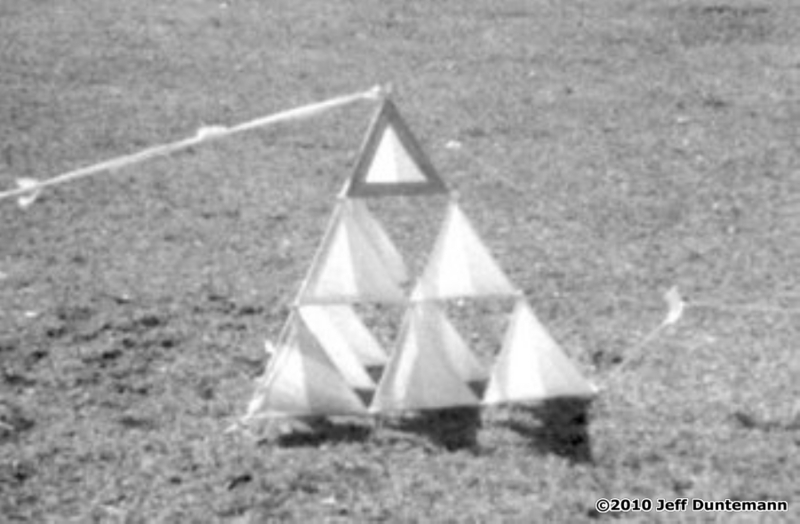 The bridle points are the two ends of the lead edge of the kite. I tied the string through the center holes of the connectors at those two ends. As with most kites, finding just the right point to attach the flying string to the bridle takes some cut-n-try. Start by attaching the string about one-third of the way down the top of the bridle. Ideally, use a knot that will allow the flying string to be pulled up or down the bridle for adjustment. There’s some finesse here: You have to tie the knot tight enough so that the pull of the kite will not change the attachment point, but not so tight that you break the bridle string while pulling the flying string up or down the bridle! 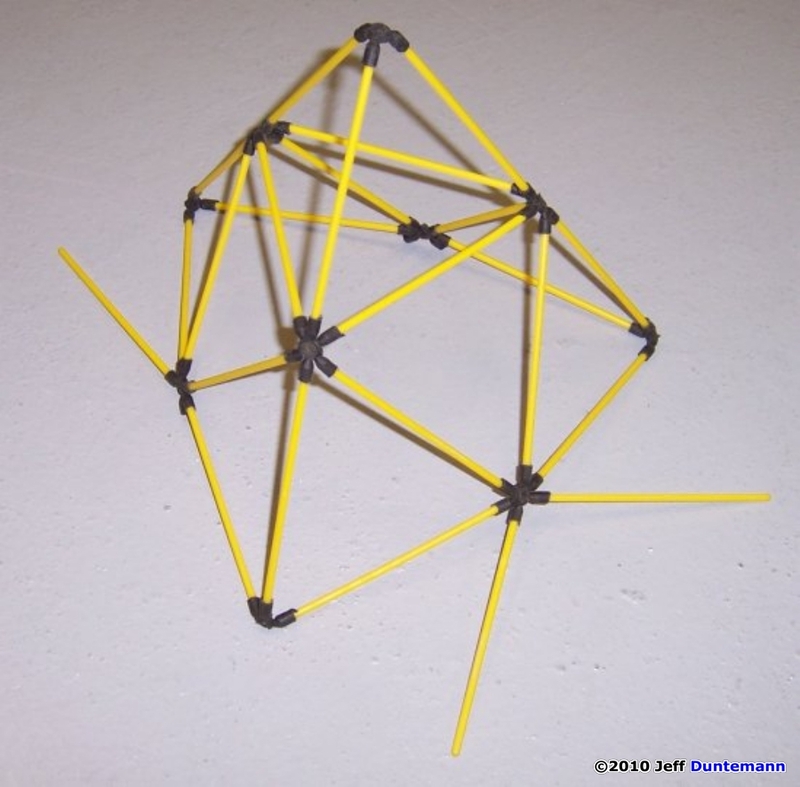 The original D-Stix instructions, and most of the kite literature I have read, insist that tetrahedral kites fly well without tails. Well, that certainly hasn’t been my experience. The original 1969 kite required a tail, and when I launched my new D-Stix tetra earlier this year I remembered why: It has a tendency to “lean” in one direction or another, and will eventually dive or loop if the wind gusts a little. 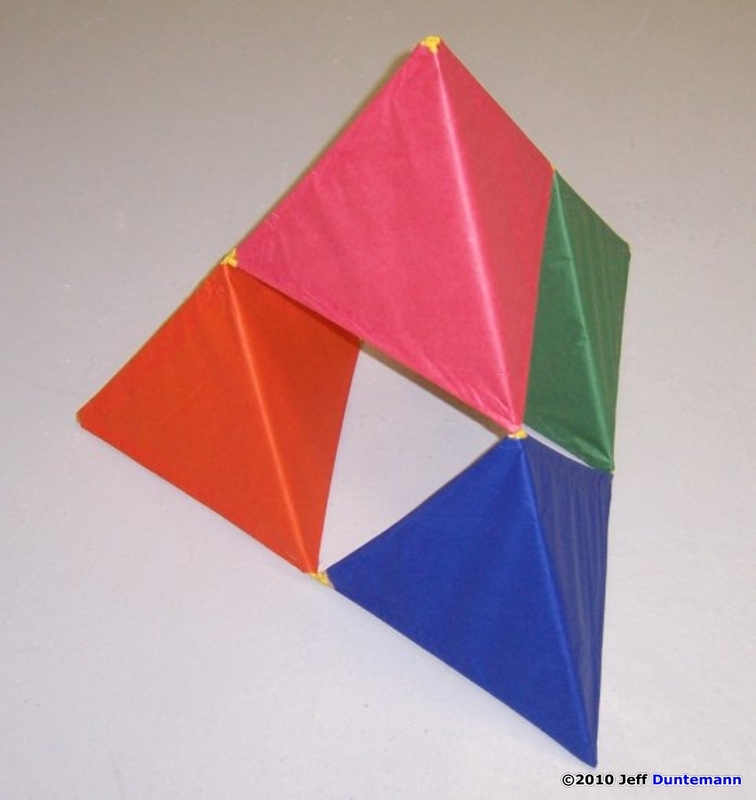 I’ve had this same problem with other tetrahedral kites I’ve made over the years, and I can’t quite explain it, but I think that the kite’s weight has something to do with the problem. Tetras have a lot of stick in them and are quite heavy for their surface area, compared to simple bow kites. I think that this makes them more sensitive to small violations of balance. Or something. Nonetheless, you should be ready with a good length of tail when you first take your kite out into the field. If you make good light “bow-tie” tail, even 8′ of tail will not bog the kite down too much, and it will make for much less, er, lively flying. 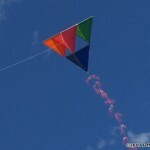 See my separate article on making kite tail for details and suggestions. It’s good to remember that tetras have more in common with box kites than with bow kites, and I’ve found that they fly more like box kites too. They pull hard, they lean, and they respond aggressively to gusts. They have a tendency to dive, and that was the end of my original 1969 D-Stix tetra. At some point it turned over and headed for the ground at speed, and when it hit, it hit hard. One of the sticks broke, and there was much ripping of tissue. I intended to fix it, but, well, I had a new girlfriend, and suddenly kites were much less an obsession with me than they had been for the previous six or seven years. It’s important to get the kite above erratic ground winds as quickly as possible. This is not the sort of kite you can launch alone by simply throwing it into the air. Have an assistant, if possible. Send the kite back with your assistant at least fifty feet. Have him/her hold the kite up high, lead edge forward. Wait for a steady breeze and turn the kite loose. Walk back sharply to make it rise quickly. Once it gets above the shattered drafts near the surface it should settle down. So here it is, on its first flight in Colorado Springs, on a gorgeous fall day against a brilliant blue sky. It’s a good kite that takes some skill to fly, and may well provide some adrenaline rush on a blustery day. It crashed on me later that day, but repairing it was no more difficult than plugging in two sticks that had popped out of their sockets and taping a small tear in one cell. 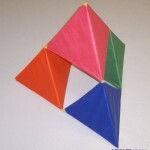 That’s the magic of D-Stix: The joints flex a little, and the kite can bounce pretty hard without breaking any sticks. Tissue is cheap (I cut out two spare cells from tissue when I made the kite, which is a good idea) and I will replace the torn cell before next summer. 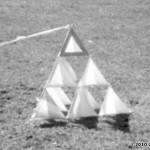 This entry was posted in 2010, General Topics, Issue 74 (Sep/Oct), Kite Building, Kite Making, KL Archive and tagged kite building, Single-line, tetrahedral.